I've had a terrifically busy few weeks since my last post. I taught a two day Portrait Workshop Boot Camp, that was fabulous. Just a great bunch of students and a couple of terrific models. I did a two day outside event of my fine art, that unfortunately, the weather did not co-operate and I had to pull out early due to high winds. I have been teaching my acrylic, pastel and portrait classes and several commissions and caricature jobs that came my way took up my time. 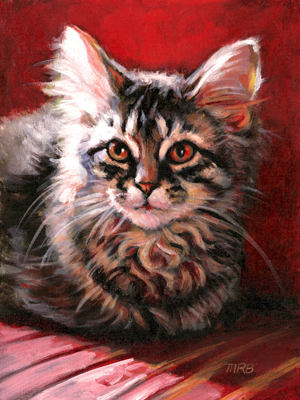 The Whole Cat and Kaboodle Challenge was posted by Dreama Tolle Perry on Saturday May 14, 2011. I got around to it this morning. Originally, I intended to do it in oil, but got sidetracked when I decided to use acrylic to cover and tone a panel that I had used to demo in one of my acrylic classes. My husband, Rich, provided the title. I hope to do a version in oil, if I can spare the time. Mary, you have done a terrific job on this kitty. You have really done convincing light! I´m chermed with the red reflection that floods everything...it belongs to my favorites of the challenger. Beautiful job on this adorable kitten! The red incorporated into everything works just wonderfully. Definitely one of my faves of the challenge! Thank you, Karla, Isabel and Sonya for your kind comments...it is greatly appreciated! Mary Rochelle. Your painting is quite dynamic....you can do flowers so well...I cannot. This has a wonderful sense of color and light - great job! Also love your DPW entry, Pulse of New York. Thank you, Kathryn and Maria!